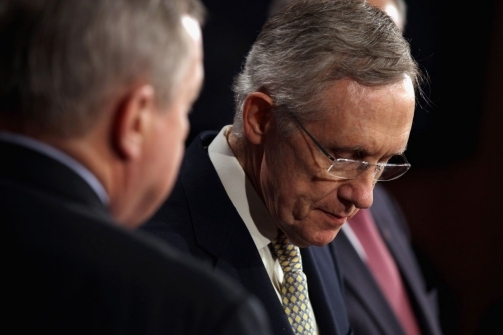 Which Poison Pill Will Harry Reid Swallow? Folks, this week is an especially active week for our community. There are numerous hearings of interest this week—one covering the internal drama of the Nuclear Regulatory Commission (in case you missed, NRC Chairman Gregory Jaczko is basically accused of running amuck), there’s a hearing today water infrastructure (one can only hope this will translate into needed action), and a hearing on reauthorizing funding for natural disasters hazards reduction programs (another clear need). Perhaps more interesting is the rumor (I have yet to find confirmation) that Congressional environmental champion Ed Markey and the crowned Congressional climate skeptic Jim Inhofe have agreed to dual over the science underlying climate change. You can be sure that we here at Spinach will find a way to tune in for this event should it go down. (1) The House proposal for the extension of the payroll tax reduction and unemployment insurance benefits: Yes, this doesn’t seem like an environmental issue. That is, until you note the attachment of unrelated measures that include fast-tracking the Keystone XL pipeline review and an indefinite suspension of any rulemaking regarding pollution from industrial boilers (otherwise known as boiler maximum achievable control technology, or “Boiler MACT”). The House will be voting on this measure today. (2) The “megabus” appropriations bill: Congress may actually wrap up all of its spending bills before the current continuing resolution (CR) expires this Friday. Hooray! No government shutdown! This seemingly happy news comes with caution and worry for the environmentally conscious. Yet-to-be released are the details of hotly-contest Interior Environment appropriations component. As you will recall, this bill contained enough environmentally detrimental policy riders that the President issued a statement of administrative policy (SAP) threatening it with a veto. Senate Chairman Daniel Inyoue claims the new bill is clear of these issues; House Interior-Enviro Approps Chairman Mike Simpson claims Inyoue is “speaking out of school.” House and Senate appropriators have worked hard to hammer out of the package and appease both sides of the aisle. We’ll see what that means for us. Keep a close eye out for more to come today; vote on this pending for Friday. These two items bring us back to the question at hand—which poison pill will Harry Reid swallow? The Senate Majority leader is promising his cooperation on the appropriations measures in exchange for the promise that the House will deal with both of these measures in tandem. Reid’s fear is that if House Speaker John Boehner gets strong enough support on the payroll tax measure that he may then send over the appropriations measure on Friday and call it quits for the year. That would leave Reid with one tough choice—extend the payroll tax and unemployment at the expense of our environment and our health, or refuse to support the American middle class and unemployed so as to protect our environment and our health. All we can say is “yeah…”. The only hope that Democrats have in this battle is to threaten not to pass the appropriations bill; as of right now, they don’t have any alternative to the House payroll tax measure. We all know that means… let the dance of shutdown loom once again. Stay tuned; the battle is only beginning.